The old saying goes ‘it's not the destination, it's the journey’. For Our Town America owner, Jane McElhaney, the destination currently has her operating an extremely successful, well-oiled machine. She along with her husband Tom are rockstars in the Our Town America family. 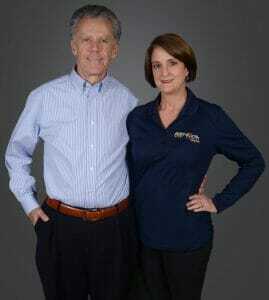 The pair, who reside in the Charlotte metro, are currently Our Town America's number one franchisee in terms of revenue. But the path to get to the destination with Our Town America, the nation’s leading new mover marketing franchise, wasn't paved with gold. Their path has been cemented in the proverbial blood, sweat and plenty of tears. Our Town America's business concept – networking, generating leads, connecting businesses with new residents – is right up Jane's alley. "I had many years in professional experience dealing with sales, so I was extremely comfortable once I learned what Our Town America was all about," says McElhaney. "Prior to buying the local Our Town America franchise, I worked in the business equipment leasing industry as well as for a direct mail fulfillment company here in Charlotte." Jane and Tom met in 1994 at a church in a divorce support group. Before long, their families, 5 children in all, would be united in marriage. Jane made the decision to raise the family as a stay-at-home mom and left the company where she was working. In 2007, the McElhaneys saw their life get flipped upside down. As their youngest daughters were preparing for college, Jane was contemplating a transition back into a professional work setting. 2007 also marked the downturn of the economy. Tom, unexpectedly and out of the blue, found himself one of the victims of the recession. "For 29 years, Tom was a devoted executive and just like that, his job was eliminated," says Jane. "We were pushed into a situation where we knew we had to do something, even though it was a time when people were getting laid off. Our youngest daughters were heading off to college, and I had been considering what's next. I thought '”How are we going to pay for college?” It's true when they say, 'When one door closes, another one opens.'" Like every journey worth telling, there's always someone along the path to help you get back on your feet following a tumble. For the McElhaneys, one pivotal person along that route was Mike Fisher, Jane's brother, and a successful owner of an Our Town America Franchise in Tampa, Florida. He had a hunch the Our Town America business model would work well for his sister and brother-in-law. "Mike invited Tom and I to come to Florida to go on sales calls and to see what Our Town America was all about," says Jane. "Plus, he didn't live too far from the Our Town America corporate headquarters, so I was able to meet Our Town America Chief Executive Officer Michael Plummer Sr. I was very impressed with the people and the culture of the company, along with the passion that Michael Plummer had for his business. By the time I left Tampa, I was ready to buy a franchise." It's that enterprising spirit that has fueled Jane's success. It's also why she says she and Tom make a great team. "I have a real outgoing personality," Jane says. "On the other hand, Tom is more laid back. He likes to analyze the situation before reacting." After careful consideration, and from Jane's recollection, 10,000 questions, Tom was on board. In a mere two months after her brother introduced them to the company, the McElhaneys were signing documents to become franchise owners in Charlotte. They haven't looked back. "When I was a stay at home mom, I volunteered with my church and other organizations," says Jane. " The community service aspect of Our Town America really appealed to her, helping direct new movers to businesses they are searching for and, at the same time, assisting local businesses in their growth by sending new and loyal customers through their doors. Both of us have a background in sales, so it was an easy transition. You must be willing to step outside of your comfort zone and introduce yourself to strangers. I have a really outgoing personality, so that isn't an issue for me. Tom is more reserved, but he's an excellent listener, which makes him a fantastic salesman. The experiences from our sales backgrounds have been extremely helpful and has made our business successful." Jane says her passion for helping others is a driving force behind her success. "Our Town America is all about connecting great businesses with great people." Four years after buying their first franchise, the McElhaneys were in a position where they could purchase the other Charlotte Our Town America franchise from the retiring owner. Three years later, in 2014, Our Town America issued a challenge to its owners. Any franchisee that sold more than 100 accounts in that year would be awarded a territory. The McElhaneys were targeting Columbia, South Carolina, where they own a lake house. "You put two sales people together and an incentive like that, there was no stopping us," Jane says. "That year was exhilarating. We kept watching the numbers climb and climb. We were determined to hit that 100-mark. Nothing motivates a salesperson more than giving them a goal." With their hard work, they cleared the mark and earned their Columbia territory. It's that rush that Jane says makes her excited every day to be an Our Town America franchise owner. "Being an entrepreneur has several perks, but one of the best is creating your own success and never having to worry about someone calling you and saying you don't have a job," says Jane. “Specifically, with Our Town America, there isn't a need for outlandish costs either. It's not a brick and mortar business. There's very little overhead. It doesn't require a building or even an office. You can work from home, you don't have to hire an outrageous number of employees. And the corporate office gives you incredible support, while allowing you to operate your business as you like." That doesn't mean business ownership doesn't come without its challenges. For Jane and Tom, that challenge came in June of 2015, when Tom, an avid motorcyclist, was involved in an accident. "He almost lost his life," recalls Jane. "I was hardly working because I was his caregiver. It was a challenging time trying to figure out how to make our business grow while he was recovering from his accident." Jane says the steady stream of income that continued to come in as their focus was diverted from the business, proves the might of the Our Town America business model. The McElhaneys also say they were fortunate to live and operate in Charlotte, one of America's fastest growing cities. In 2016, Charlotte welcomed more than 18,000 new residents. In the last decade, 888,000 people migrated to the Queen City metro. "We're in an area that's been constantly growing over the last ten years, and we've been growing right along with it," says Jane. In fact, the city’s growth has helped them secure multiple phenomenal media opportunities (like this one) – often coinciding with Small Business Saturday, giving them the opportunity to showcase how they help local businesses thrive year round. Jane and Tom have now been married for 22 years, strong. With eight grandchildren and one on the way, the couple has witnessed several peaks and some valleys. And for Jane, she's exactly where she wants to be, in large part due to Our Town America. "It's been a great experience. I don't ever look back," she says. "We have two homes. We've been able to travel and take part in some incredible vacations. Other entrepreneurs have brick and mortar businesses that tie them down. We have so much more flexibility in our lives, because of this business model. It has given us financial freedom we wouldn't have, if, at the moment of our despair, we would have gone out and decided to work for someone else and not for ourselves." One Man’s Decision to Take Over the Family Business Has Helped ThousandsUsing attractively designed mail pieces for prospective customers.